Anyway, I'd had the pattern for ages, a Knitting Pure & Simple top down, stockinette, K1P1 ribbing at the round neckline, the hem, the cuffs. A simple heathery yarn from my Elann stash. (Goldisox has stringent criteria for sweaters: no patterning, no striping, only muted colors [if they can be called colors at all], traditional ribbing.) What could be better? Knitting it correctlyfor starters, that's what. You see, I have a secret index card addiction. When the writing gets muddled, the motivations seem unclear, the plot turns into something from a truly bad soap (and I love truly good soaps), I whip out a big fat stack of index cards and start playing. One idea, one plot point, one whatever per card. As few words as possible. Incomplete sentences only, thank you. Preferably written with a big fat Flair pen in an eye-searingly bright color. And I have to write fast. Scribble an idea, toss the card into a pile. Scribble another idea. Toss the card on top of the other cards in the pile. The ideas were flying this weekend. The stack of cards was skyscraper high. It was only a matter of time before all of this rampant creativity spilled over into my knitting. See where this is going? I grabbed for my pattern and decided why lug around a burdensome 8.5 X 11 inch sheet of paper when I could reduce the opening sequences to one (or two) index cards. Unfortunately I did it W R O N G. I left out the placement of one key marker in the cast on row and screwed up the WHOLE #*@(! )##@)** THING. I knew something was wrong but I second-guessed myself into pushing forward just the same. The directions said, "Things might look strange but trust us. It'll make sense later." They're right. Done correctly it =will= make sense later. Done incorrectly, it will only get worse. Anyway, say goodbye to Top Down Sweater #1. And fingers crossed for #2. Barbara, if it makes you feel any better I just ripped out the entire cuff of the mitten I started for my daughter. There was a typo in the instructions which I didn't catch until I got to Step 2. 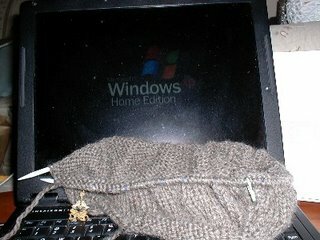 The instructions were to cast on 32 stitches and knit for 6 cm. I did that. Then increase by six stitches. I increased by six stitches. The instructions then state that you should have 42 stitches on your needles. I count my stitches and am mystified when there are only 38. What did I do wrong? So you have my total sympathy, Ms. B.! Goldisox sounds a lot like our son. Plain old, plain old in his sweaters, shirts and socks. They're sort of Joe Friday kind of guys, huh? Just the facts, ma'am. Or, in this case, just the ribbed collar and cuffs and stockinette stitched body. At least you have a DH that will wear sweaters! My guy is so not a sweater man. And he's right, too. They just don't look right on him for some reason. I feel your pain. I had to rip out several hours worth of the Wicked sweater because I dropped a stitch and made a huge mess out of things when attempting to fix it (dropping even more stitches in the progress,argh). We didn't have power for two days and I was making so much progress. Sigh, don't attempt knitting by candlelight folks. Good idea with the earring-stitch marker. I had to put an old navel ring into use when I discovered one of the animals had run off with my brand new sm's. I'm not going to comment on my numerous knitting "adventures" *cough*disasters*cough* that wound up swimming laps in the frog pond. Just know that I feel your pain. And that I think that yarn is gorgeous and well worth re-knitting. And the index card thing? Yep. Can't live without them. I have a big basket next to my desk just for index cards in two different sizes and way too many colors. They end up taped all over my office. Tucked in bags, books, cupboards, the car visor. They get washed in the back pockets of my jeans. They're everywhere.